6 a.m. Sunrise on the Mississippi. Rise and shine! Start the morning by watching the sunrise over the Mississippi River. Beams sparkle on the water, gulls soar overhead, and the entire city feels fresh and new (mostly because the streets are cleaned at night). Grab few bucks for your fare and catch the 6:15 a.m. ferry to the Westbank, enjoying the sunrise from the middle of the river. Get some physical activity while learning the history of the Vieux Carre from a park ranger at the French Quarter Visitor Center. Tickets are handed out at 9 a.m., and the tour starts at 9:30. Don’t forget to bring water and wear comfortable shoes. Antiques, art galleries, buskers, boutiques…you’ll find all these and more on Royal Street. Standouts on the pedestrian-friendly thoroughfare include M.S. Rau (630 Royal St.), a treasure trove of antiques and oddities, Trashy Diva (537 Royal St), a dress boutique with locally designed, vintage-inspired frocks, and Red Truck Gallery (938 Royal St.), a gallery teeming with eccentric, folk art-inspired pieces by local artists. Lunch at Galatoire’s is a time-honored tradition among New Orleanians. On Friday afternoons, it seems that half the city’s workforce gathers in this tiled dining room to eat, drink and be merry over shrimp remoulade and filet mignon. It’s the rowdiest fine dining you’ll ever experience…but don’t forget to follow the dress code (business casual for lunch, jackets for men during dinner). The French architects who designed New Orleans’ layout originally conceived of Jackson Square as the hub of the city’s activities–and so it remains. Ringed with shops, restaurants and museums, it features a shady park with a large fountain, where you can sit and relax in the shade. Beyond the park, find palm readers, fortune tellers, portrait painters, mimes, buskers and every flavor of performance artist conceivable. 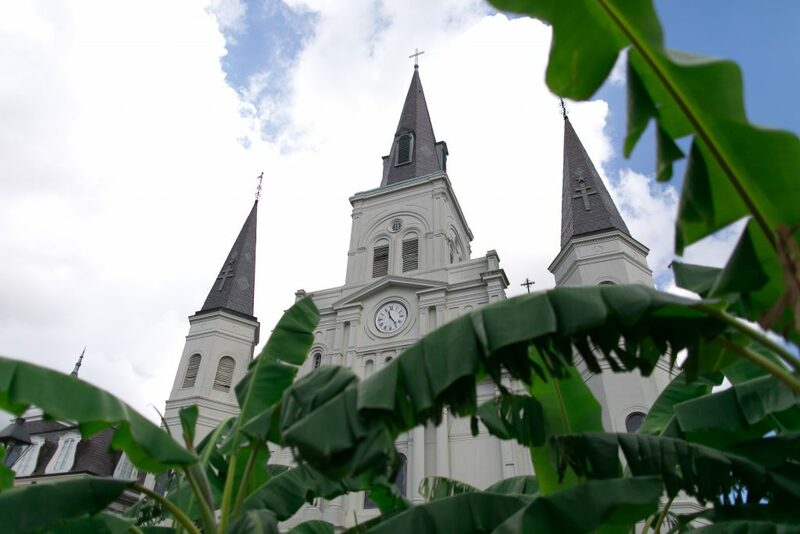 The St. Louis Cathedral is the oldest operating cathedral in the U.S.–and many believe it is the most beautiful. The cathedral is free and open to the public. Walk the aisle, admire the stained glass stations of the cross, light a candle and have a moment of prayer or quiet reflection in the pews. Visiting after Carnival season has ended? No worries. You can get your fix of Mardi Gras at the Louisiana State Museum’s Mardi Gras exhibit. Float sketches, ornately beaded costumes and videos capture the excitement of a parade. Creole fare meets Italian cuisine at this intimate eatery. Its softshell crabs are some of the best you’ll ever taste. Settle into a deep leather chair at this handsome restaurant/bar and enjoy the sounds of trad jazz, cocktail in hand. You’ll feel like you’re in a 1940s-era nightclub (and the martini glasses actually are vintage). Check the nightly offerings here. It’s cheesy, it’s tacky, it’s neon-lit, and it’s an absolute must if you’re visiting New Orleans. Order a hurricane to go from Pat O’Briens (718 St. Peter St.) and make your way down the corridor of decadence. Stop in any club that catches your eye, hit the dance floor, make a friend or make a fool of yourself–that’s what Bourbon Street is here for. Wind up your Bourbon Street expedition with a visit to this ancient, weathered, candlelit bar, where privateer Jean Lafitte once held court, and where it’s easy to feel like a modern-day pirate. After all, it’s the longest operating bar in the U.S.
At this point, you could probably use some food. Deep-fried and topped with mounds of fluffy confectioner’s sugar, beignets hit the spot. Paired with a steaming hot cafe au lait, they just might give you a second wind. Which is good, because you’re going to need it. Lots of different nightclubs have called this address home over the years. 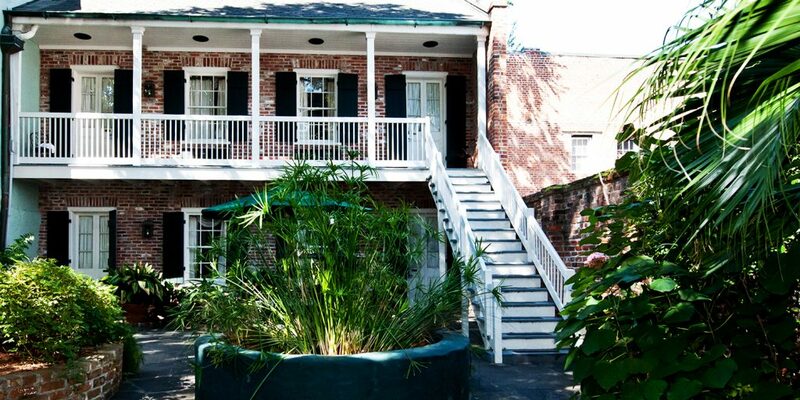 Its current incarnation is Santos Bar, a spinoff from the hip Garden District hotspot called The Saint. Every night has a different theme and a different late-night dance party. 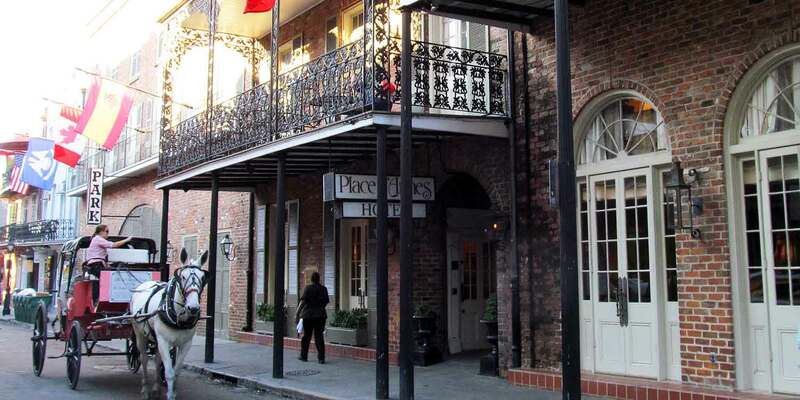 Place d’Armes features a number of rooms with balconies overlooking the French Quarter. Sit back, relax and congratulate yourself on a truly epic day (and night) before hitting the pillow. Then enjoy your rest…you’ve earned it.